The first prototype of the orchard dehydrator (O.D.) consisted of a solar air heater joined to a vertical multi-story array of wooden shelves and covered with cotton tulle. This gives an effective drying area of 7 square meters. The air heater, comprised of an inclined matrix of steel shavings ten centimeters thick was essentially the same as that used in the laboratory type of dryer (see preceeding case study). 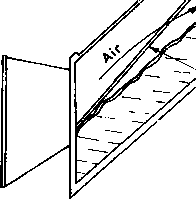 The ambient air enters the heater from the lower south edge, is heated in the hot matrix and is then admitted to the insulated mixing chamber. The heated air then rises through the 18 cotton tulle-covered shelves and is exhausted through adjustable vents on the top northern edge. Two layers of polyvinyl chloride (PVC) plastic enveloped the exterior surfaces of the entire dehydrator. in each drying test, comparison tests were done on a control shelf for sun drying,and in another shelf (so-called shelf 1) located in the laboratory type of dryer. Only natural convection .was used in the orchard dryer. Further slight improvements of the O.D. led to the improved orchard dryer (I.O.D.) whose design can be seen in Figure 2. 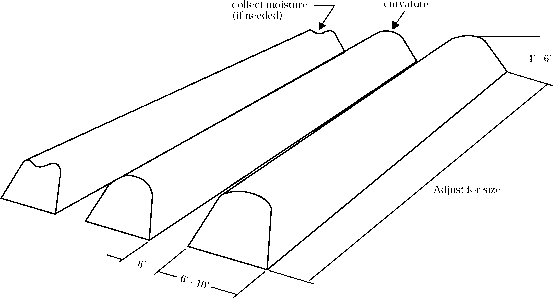 Dimensions; See Figure 2 for the dimensions of the improved orchard dryer. Relative humidity is usually low in the drying season (July to September), averaging about 80% in the nights and 40% at noon. There is usually no rain from June to October. The investigators consider these units about ready to go into field operation.